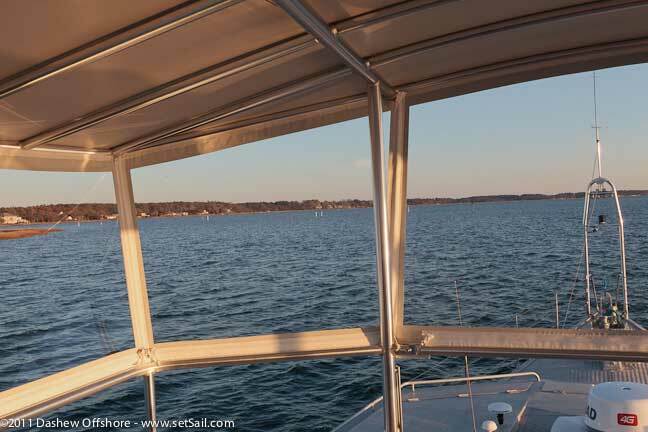 The lead photo is a difficult night shot, taken during sea trials a few days ago, looking through the windows of the now enclosed flying bridge on Wind Horse. The optical clarity of these windows is stunning, significantly better than the glass which surrounds the great room below. There is no sense of barrier between us and the exterior. And so far, in a variety of lighting, the clarity has remained. There are few visual impediments, just four pipe supports, and a few narrow tapes around the window perimeters. The flying bridge frame is now covered by a Stamoid fabric roof, banded rather than tied in place. The roof is designed to shed water, but otherwise to be visually unobtrusive. The windows rotate inward and up when open, with bungee cords and special hardware to hold them open. This “EverClear” enclosure system is the work of Preston Lea, Carteret Canvas, Moorehead City, NC. We’ll have to wait until relaunching in the spring for a nice anchored photo. 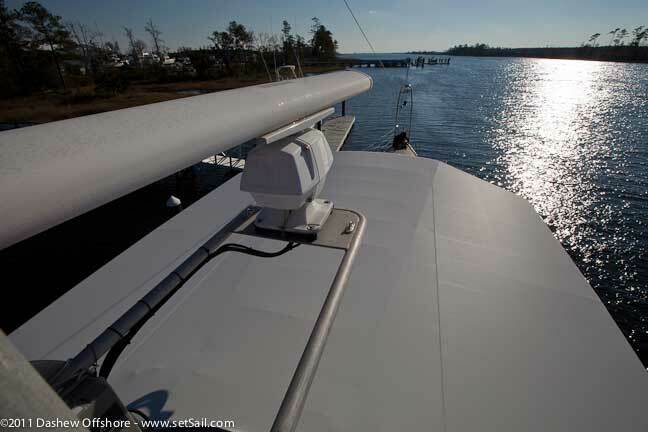 In the meantime, we’ll be thinking about how to bring the navigation instruments to the flying bridge. This entry was posted on Tuesday, December 20th, 2011 at 8:41 pm and is filed under Dashew Logs. Both comments and pings are currently closed. Brilliant! Proves the value of a ‘test-bed’. Could this approach be adapted to the ‘big sister’ as an option in place of the upper wheelhouse (with outside stairs, of course)? 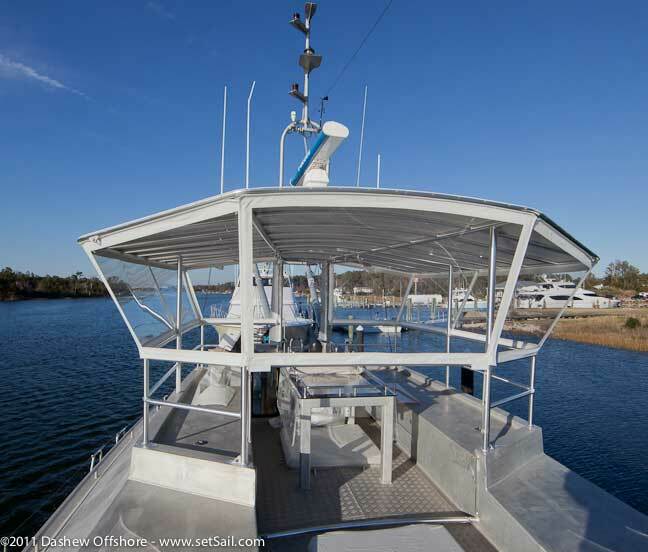 Maybe also an option to swap to moaquito netting when anchored/berthed in malaria-prone tropics? We have not looked into mosquito netting as this would add quite a bit of complexity and visual interference for the attachment requirements. 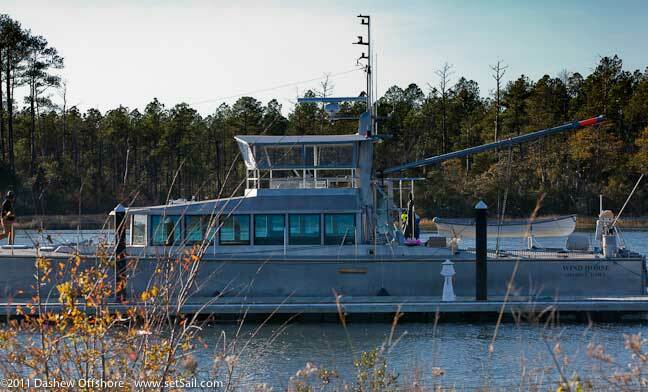 Re the FPB 115, this could be used on the main deck, but the pilot house area is not a candidate within this design concept. Great job on the enclosed fly bridge. What prodcut cleans it? 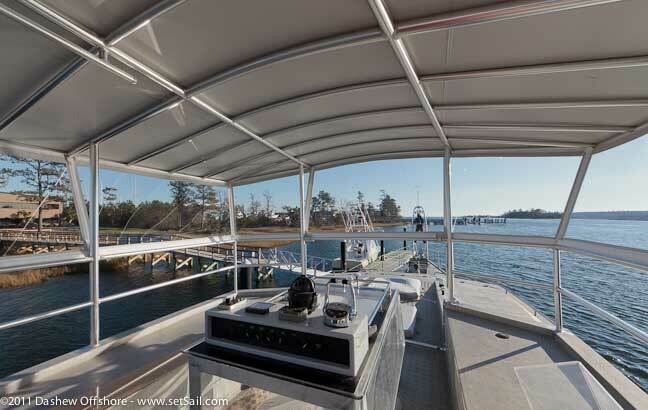 Ours is a more conventional Sunbrella with Strataglas and a hard glass Seaview wiper window in front of the helm. In the PNW bridge enclosures add to the experience, but when the sun is shining it becomes an oven unless the sides are up. For the top and “glass” what is your guess for the cost add on % vs Sunbrella/Strataglas? 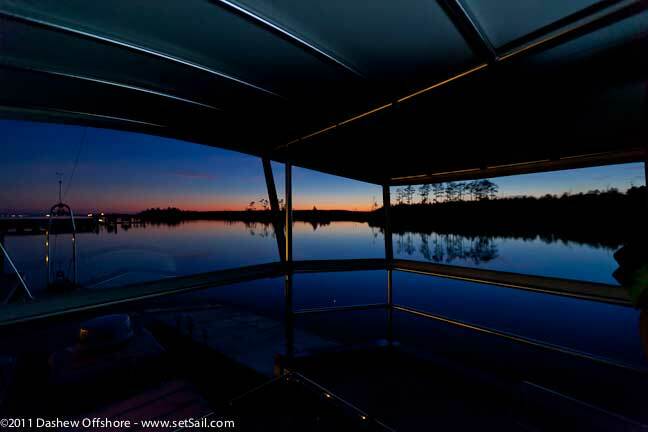 The cost delta with Strataglass and Sunbrella is about 40% given the details we used. Cleaning is with soap and water. I am headed down the stamoid/strataglass path myself with my dodger/bimini. I am curious what “banded vs tied” bought you and what the exact details were for the attachment to the frame. Are you using a zippers on the tapes to keep it all closed up? PS.Linda is going to be busier than ever with her squeegee. Yes, zippers f or the windows. Banding is accomplished with a stainless steel strip over the Stamoid edge. The stainless is attached with self tapping screws. Is this going to create any drag and reduce fuel efficiency and/or speed? Additional drag is inevitable with the windows, if they are closed. But this only applies with wind from head to aft of the beam. On the quarter to running there is a benefit. Trying to figure out what is happening at the front end of the flybridge where the gates used to be. Is the lower section open or also enclosed with the EZ2CY. If the latter, where does it “disappear” to? Merry Xmas to Wind Horse and her crew from Iron Lady and her crew. There is another section of the EverClear in the lower center area with a fabric hinge, so it folds open. Photos of this wil have to wait until spring. Great pics, Mr. Dashew! We hope you enjoy the enclosure & are privileged to be a part of “Wind Horse”! Nice idea, would it be possible to design and implement a folding version of this using same materials? These windows are stiff, so they will not roll. However, using fabric hinges they open easily, and swing up and inside. Doing this with a folding dodger would take some creative engineering. Another advantage of clear enclosures is their reduction of UV exposure. As one who’s been getting a few ‘cut n paste’ jobs from the dermatologist, I greatly appreciate this feature. Looks fantastic. Amazing how great the lines blend it. Too bad most designers don’t include the bimini/dodger/enclosure design and leave it up to people who are primarily “tailors”. I loved the results so much, I almost overlooked the solar panels……? We are planning on a back up. As soon as we catch up in the office we’ll do a post on what we’ve found. My opinion is….well, i can see the benefits, but it’s not beautyfull, the enclosure is not even nice to look at. But I imagine that it’s kind of practical, and comfy. I guess its true that ‘beauty is in the eye of the beholder’. I actually think it looks pretty cool – obviously I have a different ‘eye’. Still, the world would be pretty boring place if we all had the same opinions(it would certainly diminish the point of recreational travel). Not sure I would characterize it quite that way. Wait til spering when we have a chance to get some good photos, and remember those windows fold up, out of t he way, and out of view.